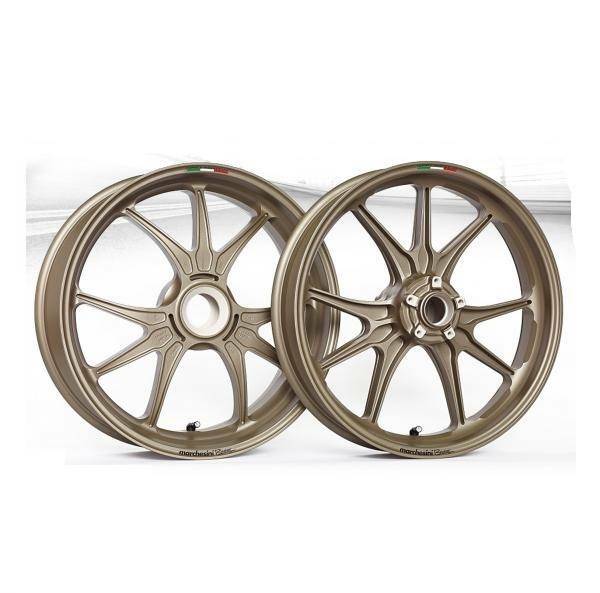 Marchesini presents the new M9RS Corse wheels, which marks the return to the production of magnesium alloy forged wheels for road use. These new magnesium wheels have a 9-spoke design in PSI (Ψ) with a racing style, developed in the most extreme international motorcycle racing. The M9RS combine these features from competition to comply with the strict standards of validation necessary approval for original equipment. Compared to standard aluminum models, these beautifully made wheels enhance the vehicle dynamics and direction changes are dramatically improved, thanks to a weight reduction and 14% and 16% off of the inertia. This model of wheel was premiered on the new Ducati 1199 Panigale R Superleggera, and are produced in very limited numbers. Reducing huge amounts of weight when compared to stock wheels, these multi directional forged wheels are unique in manufacture and offer a perfect compromise between weight reduction, performance and lifetime of the wheel. This forging process ensures these wheels are the strongest in the aftermarket due to its high density molecular structure. Experience in the original equipment supply gives Marchesini the edge it designing wheels that last. The result is a wheel that weighs 45% less than the original set and with a 30% inertia reduction. These characteristics provide faster accelerations, improved handling on bends, and improved control due to improved gyroscopic effect. A mounted set of magnesium wheels weighs about 7.5 kilograms and is completely interchangeable with the original set. The original Superleggera wheels through Ducati cost over $6K. 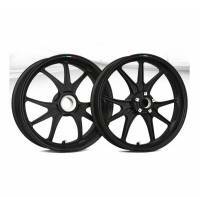 * Register on the Motowheels website for Free forum to access discounts on most non sale items or lifetime VIP passwords for the deepest discounts on all items.